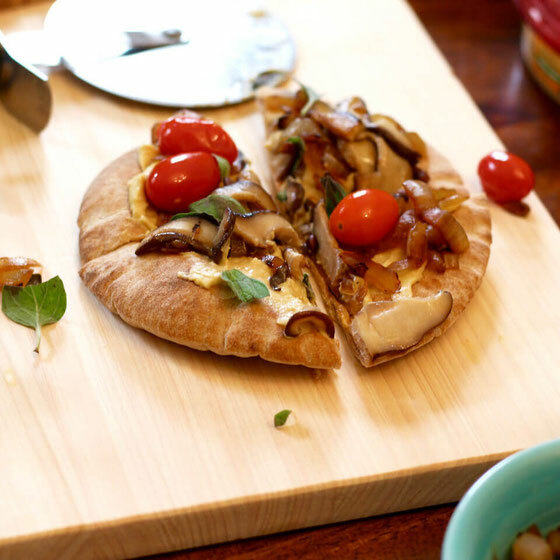 This vegan hummus pizza is sure to jazz up your next get together. It will also make a stellar afternoon snack! 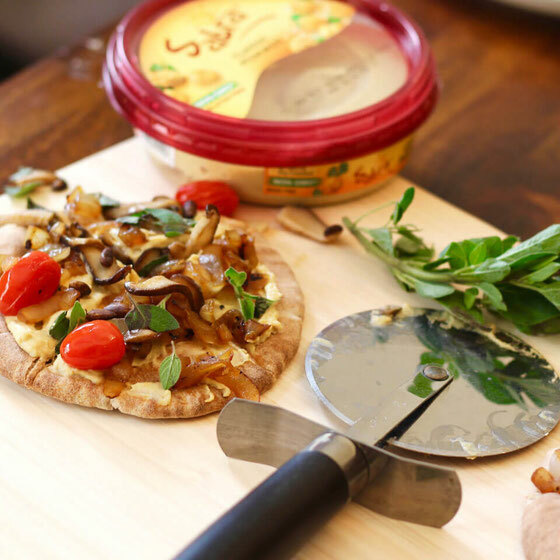 Disclosure: This blog post was sponsored by Sabra. All opinions are my own, of course (and as always)! As a vegetarian, hummus ends up being a pretty big staple in my diet. I often pair it with grape tomatoes and sliced veggies for a satisfying snack. While this stand-by is tasty, I've recently been thinking up new, innovative ways to use the ingredient. So I came up with pita pizza idea. It's pretty simple to make and combines a bunch of my favorite ingredients. Did I mention it's super yummy, too? 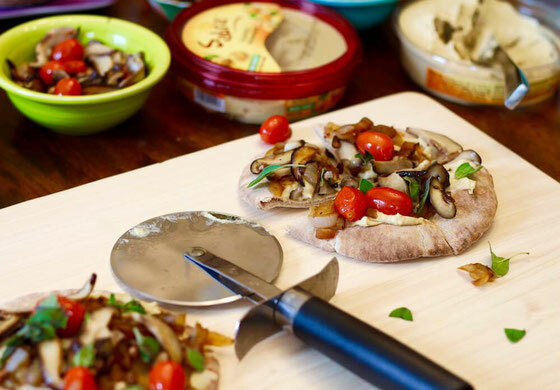 Mushrooms are one of my favorite foods on the planet, so I had to add some to this pita pizza. I sautéed up some shiitake slices and also caramelized onions, roasted some pine nuts, and heated grape tomatoes for toppings. The final finishing touch? Fresh oregano. I have to say my creation is delish. And with Super Bowl Sunday around the corner, I'm thinking I'll make these for a game-day get together with friends. Bonus: These mini pizzas are great to serve during Heart Health Month, since they're heart healthy, according to the guidelines set forth by the American Heart Association. Each half-pizza portion is low in both sodium and saturated fat and provides 3 grams of fiber, 12 percent of the daily value. Preheat the oven to 250 degrees Fahrenheit. Place pita bread on non-stick baking sheet and toast for 10 minutes. Meanwhile, heat 1/4 cup water in a small pan over medium-high heat. Add onion slices; spread onions evenly in the pan, stirring occasionally, 5-6 minutes. Once the liquid is absorbed and the onions begin to brown, stir frequently until they're caramelized. Set aside. In a small pan over medium heat, heat olive oil. Add mushroom slices, stirring occasionally. Once mushrooms are almost cooked through, about 5-6 minutes, add tomatoes. Cook an additional 2-3 minutes. Meanwhile, increase oven temperature to 350 degrees Fahrenheit. Place pine nuts on baking sheet and toast 8-10 minutes, tossing once. Spread each pita with 2 Tbsp. 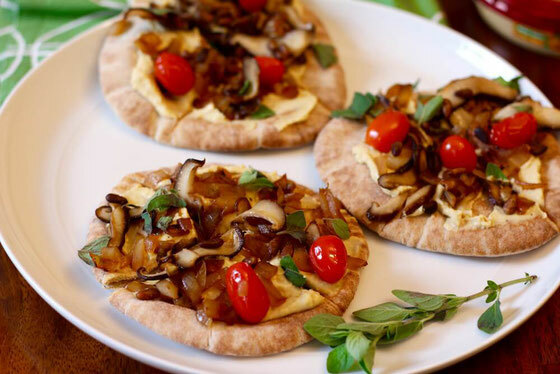 hummus, then top with onions, mushrooms, and tomatoes. Add pine nuts and oregano. Slice pizzas, and enjoy. Serves 12. What are your thoughts on this topic? What's your favorite way to enjoy hummus?